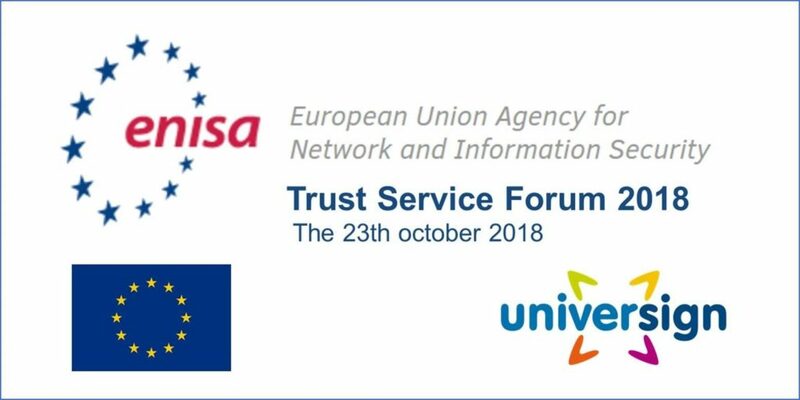 Universign attends the Trust Service Forum 2018 organised by the ENISA, European Union Agency for Network and Information Security, on October 23rd and 24th, 2018. ENISA is a centre of expertise for cyber security in Europe. The Agency works closely with Members States and the private sector to deliver advice and solutions to be well-equipped and prepared to prevent and to detect cybersecurity threats. ENISA, in collaboration with the European Commission, launched in 2015 a Forum to bring together the three stakeholders in the qualified trust service market, namely: trust service providers like Universign, conformity assessment bodies like ETSI and supervisory authorities like ANSSI for France. Universign will be represented to the Trust Service Forum 2018 by Andrea Rock, R&D Engineer & Standardisation Expert. Andrea will participate to a round table dedicated to remote signature, new opportunities for Trust Services. Andrea will also represent Universign to the CA Day, dedicated to Authority Certification, on October 24th. She will introduce ETSI standards Infrastructures for Electronic Signatures and Signature Validation Services.